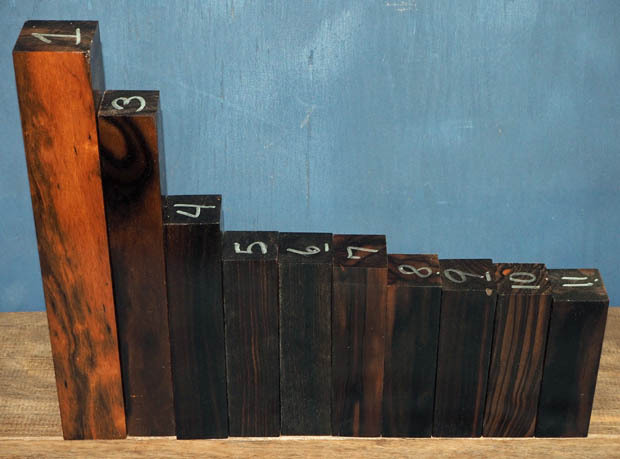 Macassar Ebony is another true ebony with exciting color and striping. 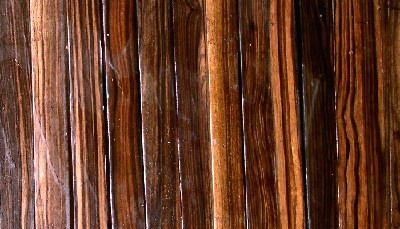 The striping varies in width and color. The predominant color is almost always black, and lines are interspersed with charcoal grey and pinkish tan. 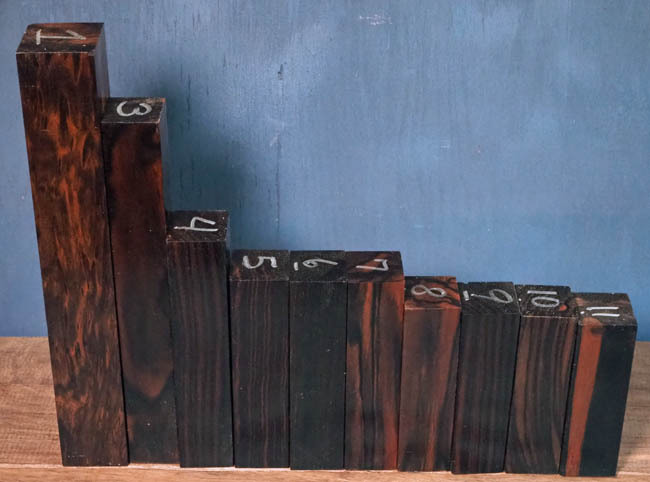 It works very much as you would expect an ebony to work, and is an excellent turning wood. It is also commonly used for musical instruments. It polishes to a high gloss (almost metallic if you want it to be). All are high quality with no sapwood unless specifically noted. 1" material is kiln-dried, thicker material is partially air dried unless specifically marked as being dry. Occasional shipments are making it through, with legally limited sizes. 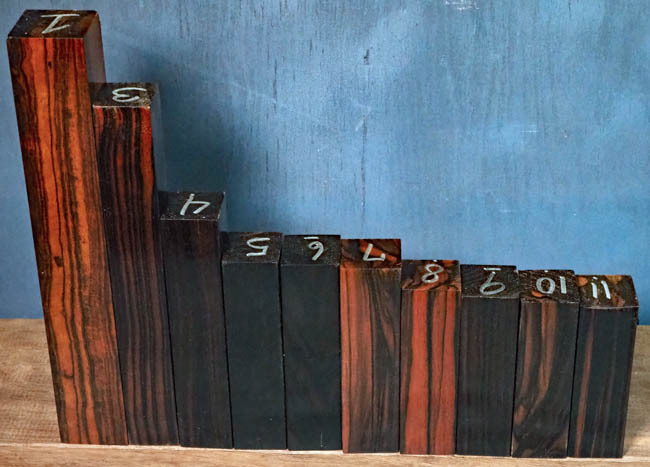 We do have 1/1.5 inch lumber, only shorts are allowed by law for lumber, usually around 40 inches long, 2.5 to 4 inches wide (generally). Click the photo for view of side 2. Actual pieces shown, order below. These figured (very uncommon) squares are diospyros spp. one of the types called macassar. Dried--all pieces. Pieces missing below are sold.. 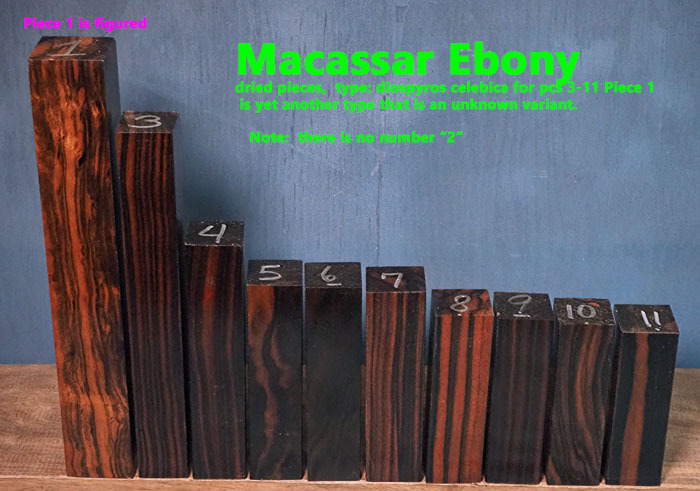 The normal price for macassar ebony 2 x 2 x 12 is $40 without figure, this is a VERY special buy!. Click here for a THIRD side view. Click here for FOURTH side view. This group sold, however more will be dry around the end of April 2019 (approx). and desire to use some of our photos on your website, email us with your request.